LUMA8, in collaboration with the Department of Cultural Affairs and Special Events and the Chicago Park District, is pleased to announce Arts in the Dark, a festive and enchanting nighttime Halloween Parade along Columbus Drive, on Saturday, Oct. 21 from 6-8 p.m., that will showcase the creativity of Chicago’s diverse cultural community and inspire the next generation of artists. Arts in the Dark will begin marching on Columbus Drive at dusk, traveling from Balbo Ave. to Monroe St., and will be led by eight “Illuminators” chosen for their remarkable efforts in their respective creative fields. 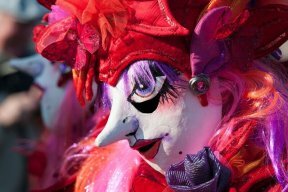 It is “parade as art” as contingents combine costumes, masks, spectacle, music, movement, lighting elements and audience engagement. The Art Institute and School of the Art Institute will march in medieval-style armor, Broadway In Chicago will invite their devoted fans to dress up as their favorite Broadway characters, and After School Matters will have multiple programs participating including West Town Bikes with decorated cycles and riders, the Mariachi Ensemble, Aztec Dance Chicago and The Art of Drumming. LUMA8 also is calling on individual artists to join the parade by creating lanterns using the theme “Under the Sea and Up in the Air.” Awards will be given to the artists with the most creative and best executed lanterns. The Arts in the Dark festivities will kick-off at 4 p.m. at Buckingham Fountain, where the Chicago Blackhawks street team will host a pre-parade celebration including music and a Blackhawks inspired mural to commemorate the artist’s holiday in conjunction with hockey. Party-goers can post pictures to social media for the chance to win Blackhawks prizes. This family-friendly event is free and open to the public. For more information, visit www.ArtsintheDark.org.